As I noted in the preface of Working Class Hero, I support Tom Brokaw’s concept of The Greatest Generation. Yet, without detracting from the record of that group, I wanted to draw attention to the preceding generation, that of the parents who raised these people and instilled in them the qualities and values that were so essential to their later performance. I chose to illustrate that stalwart generation through one of its two lives that I knew best, that of my father, Jim, who lived from 1884 to 1954. On the occasion of Father’s Day, 2014, I would now like to present excerpts from my book that deal specifically with his role as a parent. At the outset, I quickly learned the need for restraint. Jim was a father who gave freely and widely of himself, and it seemed that extensive parts of the book, covering most aspects of his life, deserved to be quoted. For the narrow and sharp focus desired, I had to start all over again, realizing that a brief posting cannot fully cover a man’s achievements as a father; it can only suggest the flavor of his efforts. For the first two years of Jimmy’s life, there is probably no more eloquent description of Jim’s feelings toward his son than his own expressive face as it appears in photographs of the two together. Love and pride are easily seen. There is something else – a sense of awe and marvel as he looks upon this little creature that has been entrusted to his care. These are pictures of a devoted and responsible father. When his son was quite young, Jim told him the story of a father who placed his little boy on a mantelpiece and said, “Jump into my arms.” As the boy jumped, the father withdrew his arms and let his son crash to the floor. The moral of the story was, “When something important is at stake, never depend on anyone but yourself.” Jimmy got the message, but it could not have been more unlike the actual relationship between the two. Jim was always there for him, discussing, advising, encouraging, helping, and even doing his job for him when necessary. One example of that last point was Jim’s doing algebra homework for several weeks while the subject remained an impenetrable mystery to Jimmy, until finally there was a breakthrough and the subject became easy for him. This might be viewed as treatment that could “spoil” a child. But somehow the boy understood that it was an emergency measure, not to be expected as normal practice. Perhaps the story of the mantelpiece had something to do with that understanding. 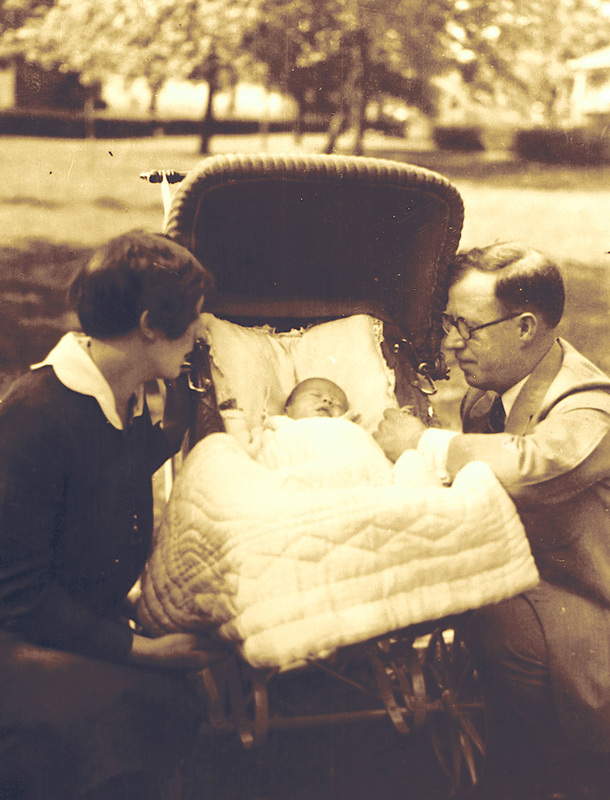 Jim became a father at the age of forty-two, but there was no lack of vigor when it came to raising his son. There was an endless sequence of expeditions to parades, circuses, carnivals, amusement parks, concerts, movies, picnics, museums and other points of interest. New York was a favorable area for endless explorations, and these were on the agenda most Sunday afternoons. Jim tried to teach the boy to play baseball, an unsuccessful effort probably because of the boy’s eye problem. Jim purchased boxing gloves and taught the boy self-defense, an asset that never increased his desire to fight but one that gave him confidence, something he would need on the streets of New York. Jimmy and Jim in a Coney Island, N.Y. “photo studio”, late 1936 or 1937. The family has moved to Kew Gardens, New York. Jim’s efforts to guide the boy’s attitudes and behavior relied mainly on discussion and reasoning. Sometimes he placed undue faith in the boy’s ability to understand. One amusing example of this occurred when his son was seven or eight years old. While the two were at a circus, Jimmy spotted “chameleons” (anolis lizards) for sale, and he simply had to have one. The little creatures were chained to lapel pins, mounted on a large board, and offered at twenty-five cents each. Jimmy could not accept the idea that one of these might die in his tender care. While he noted the cruel treatment of the lizards by the dealer, he saw purchase as a means of rescue. He would have to study economics before he could ever comprehend that buying one might just cause more to be caught. So Jim retreated to his argument of last resort. He spent a long time outlining the family finances – where the money came from and all the places it had to go – with the conclusion that he could not afford the lizard. By the end of this, Jimmy was glassy-eyed and sufficiently bored to accept the argument. He didn’t get the lizard. But for a long time he wondered how his Daddy ever managed to afford the circus tickets. When discussion and reasoning did not bring the desired results – generally in cases of sulking, defiance, or disrespect – Jim would apply corporal punishment. He had several strict rules for this, which together assured an intense and close personal interaction between father and son. First, the punishment had to be prompt; the only excuse for delay was to secure privacy. Second, it had to be as brief as the nature of the offense allowed – often a single slap, several in the most extreme cases. Third, Jim’s hand was the only acceptable instrument; he strongly disapproved of sticks, belts, or any other devices that might have a distancing or depersonalizing effect. And fourth, his facial expression during punishment showed strong disapproval of the offensive behavior – suggesting anger but never out of control. He did not risk the mixing of signals that might result from punishment with a loving expression, but the loving expression soon reappeared after the punishment was finished. On one occasion, after several whacks on the rear, Jimmy came to his father with a serious limp, claiming that his hip was in great pain. Jim said, “I see you’ve read that news article about the girl who was crippled by her father’s beating. Well, don’t worry. That didn’t happen to you, and you’ll soon be all right.” It took the boy about three seconds to give up his pretense. Jim often stressed the principle that, if something is worth doing at all, then it is worth doing the right way, worth doing with full attention and to the best of one’s ability, and worth doing completely. This came up most often in connection with schooling. It was quite frequent that Jimmy would report some good achievement like a 98 percent grade on a test, and Jim would respond by asking, “What went wrong?” As he finally got the boy to understand, this question did not represent any dissatisfaction with the 98 percent. It was a suggestion to investigate the 2 percent that he missed. Then he would know it all! When Jimmy showed repeated anger or irritation toward someone else – usually another boy at school – Jim would say, “He’s got your goat. Get over it.” The “goat” expression signified that the other person had become such an obsession that he was controlling one’s moods. One needed to find a way to let loose of these feelings. As he moved into the teen years, Jimmy developed resentment toward his father that lasted until about the age of eighteen. It began with blame for moving from his beloved Wheeling to New York. The family of Jimmy’s mother supplied him with all sorts of petty reasons to resent his father. Punishments by his father undoubtedly added somewhat to the resentment. By far the greatest sources of resentment, however, were Jim’s intellectual qualities. His unusual viewpoints, his self-assurance, his eloquence in arguments, his overall brilliance and his strong presence – all these traits comprised a “dominance” that made the boy feel threatened and diminished. And so it went, no doubt, with countless male teen-agers. Fortunately, the boy’s feelings were never aired, and the two had many good and close times together. Jim never showed awareness of the resentment, but he was wise enough that he probably sensed it and ascribed it to the inevitable vagaries of the teen years. He never doubted the boy’s love for him. Both father and son felt the security of unconditional love. The important thing is that, as Jimmy passed into manhood, he realized the pettiness of his resentments and came to terms with them. 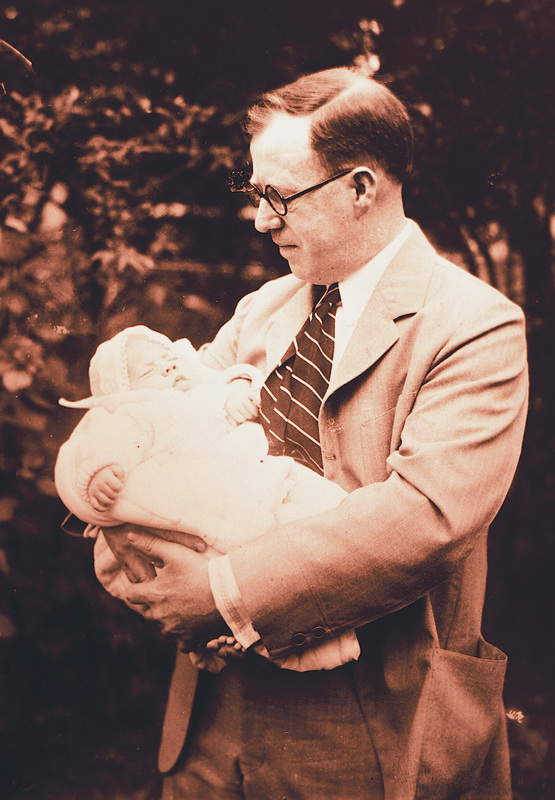 After the move to New York in 1936, Jim and his son had many extended separations from one another. Early on, these were occasioned by the boy’s love of Wheeling; later by difficult wartime housing conditions; and still later by such activities as military service, college, starting a career, and family responsibilities. Jim never had a complaint about any of these absences, and both father and son were joyous and enthusiastic at their reunions. The picture lingers of Jim meeting Jimmy at the railroad station as he arrived on a short vacation from college in early 1950. As the car was still coasting to a stop, Jim could not wait: His face was beaming, his arm was waving, the driver’s door was open, and his left foot dragged on the pavement in an effort to stop the car. The last time the father and son were together was on March 1, 1954, when Jimmy drove Jim to Johns Hopkins Hospital in Baltimore. Jimmy regarded this as a minor event, during which diagnostic studies would soon lead to new treatments that would restore his father’s health. Therefore he scheduled it as a brief morning trip, assuring his boss that he would be at work right after lunch. It seemed that the drop-off would be even shorter when a guard said that parking by the hospital entrance was not allowed – then, seeing Jim’s difficulty walking, relented and allowed parking for ten minutes. Jim, of course, was much more aware of his plight. After check-in, as the two walked toward his room in the Osler Wing, he made a joke. “Now this is really a bad omen. Dr. Osler was in favor of euthanasia for sick old people!” As they reached the room and took their farewells, Jim showed one of those familiar signs of an emotional moment. An expression of incipient weeping flashed across his face and was gone in a second. This haunted Jimmy as he returned to the car and drove off, with the result that he found a place to park and returned to spend the afternoon with his father. It was a quiet and restful time for both as the old man ate his lunch, talked about his hopes for diagnosis and treatment, pointed out a new symptom (the left thumb had gone numb), and generally relaxed. At the final farewell he lay on his bed, head propped up on one arm, smiling and waving goodbye. Rightly or wrongly, Jim’s son picked up the message that Jim, while not atheistic and probably not agnostic, did have serious doubts about how the established religions presented God. Jim did not pretend to know the nature of God, did not think that one could know it, and was not particularly troubled about not knowing. He seemed to believe that “miracles” and “revelations” were either natural events or artifacts of the human mind or some combination of the two. He placed his emphasis instead on concepts and ideals of this world. One of the most important of these was being a “Man,” and raising his son to be the same. This term had to do with integrity and honor and many other virtuous human qualities and behaviors. Jim stressed honesty, loyalty, and responsibility in all his dealings, and he sometimes carried generosity in thought and deed beyond what he could afford. “Man” in this context was not gender-specific, but since both Jim and his only child were male, that question never arose. Jim kept a framed copy of Kipling’s poem “If” on the wall, and he used it extensively in teaching his son what he thought were the important virtues. The poem is not a complete definition of his concept of a Man, but it probably comes as close as any one-page document does. The argument of the poem is to enumerate a number of virtuous behaviors that, if achieved, will yield certain benefits including, “And – which is more – you’ll be a Man, my son!” Jim would reprove a misbehavior by his son by quoting from memory the specific lines from “If” that pertained. Jim’s concept of being a Man was, for him, the foundation of an entire philosophy, a source of guidance and stern discipline that some others would seek from a Bible. 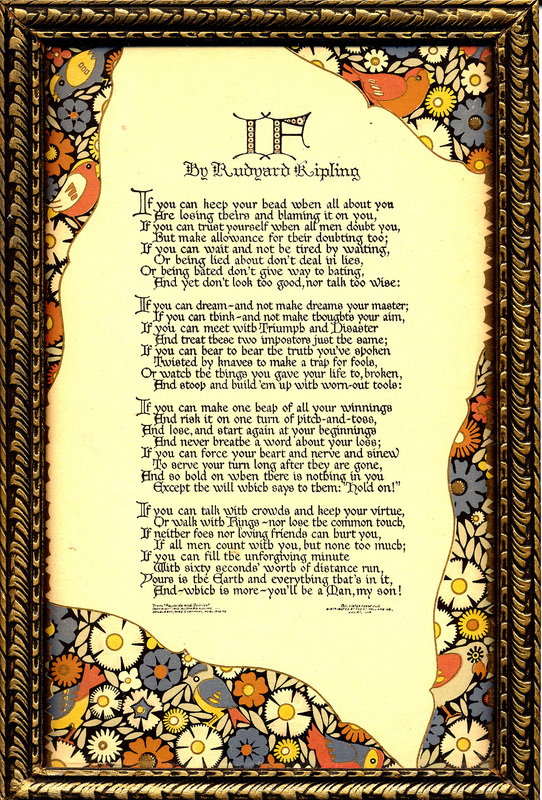 Jim’s framed copy of the poem “If” by Rudyard Kipling. A second concept, closely related to the first, was the importance of developing and using one’s Mind. Jim never put it in quite these terms, but his general feeling seemed to be that, just as a person’s quality of character might be measured by one’s achievement of the virtues that make one a Man, so also could a person’s breadth and depth be measured by the extent of one’s interests, knowledge, and understanding. He started with basic functions of the mind such as concentration, memory, and logic, and sought every means possible to refine and improve these. When raising his son, he presented games specifically designed to foster these abilities. He had a natural affinity for the great areas of study that offered a better understanding of our world and ourselves. These started with philosophy, and he became familiar not only with the great philosophers of the previous several hundred years but also with the ancient Greeks as well. Among the Greeks, it perhaps showed his own tendencies that he was most intrigued by Socrates, the great questioner of his society’s values and assumptions. Jim’s focus was on secular philosophy, which he considered the province of great minds and creative genius. He had no interest in religious philosophy, which he considered more the domain of established dogma. From philosophy his interests extended into political science and economics, which also had much to say about how the world works. He never said anything about psychology or psychiatry, which itself may indicate something about his regard for those disciplines. From these great subject areas, Jim extended his interests into every conceivable field that might further develop the mind. He turned away from no subject simply because it was trivial; his criterion was whether it offered any mental stimulation. Whatever the subject at hand, if it met that criterion, it got his full attention. His mechanical aptitude was limited, and one might think that this area would be the least interesting to him. But even here he found mental challenges. He developed a sort of consciousness of the inanimate world that gave him a feel of how objects would behave and react. He expressed this in many venues: “It’s not enough just to hit the golf ball. That ball doesn’t know where it’s supposed to go, and you have to tell it.” The same for sawing wood and for driving a nail. He was so intrigued by the action of a golf ball that he went on to invent some kind of stationary machine for practice driving. Apparently the ball was supposed to stay mounted on a spinning arm, but Jim never quite found a way to keep it from flying off under the force of the drive. Given Jim’s interest in development of the Mind, it is no surprise that he placed great value on education. He had high respect for educated people. For his son he tried to get the best possible education even at the high school level – until he found that his financial means were insufficient – and later had high hopes that the boy would go all the way to a doctoral degree. It seems that he may have been overly optimistic about the difference an education could make. The best evidence for this was the way he, a school dropout at age fourteen, towered intellectually above just about everyone he met. Jim had remarkable skill at creating rhyming and rhythmic poetry on very short notice. Some poems were for his son’s entertainment, as in the first two examples below, or deadly serious and on his son’s behalf, as in the third. On the beach at Chesapeake Bay. And that was the end of a perky brat. Dust trap it was, and nothing more. Unless you’re busy with Lenore. Upon the night’s Plutonian shore. Nor be disturbed because we snore. Or to maim and butcher another’s son. And I, an implement in this design, Must ask you justify your call. That ne’er existed – Like the ways of your claim The bud that never flowered. And ever since have felt I was befooled). And never reach the canker that’s beneath it all. This entry was posted in Other Times and tagged Childhood, Father, Parenting. Bookmark the permalink.